The release date for Ridley Scott’s Prometheus is looming, and the marketing materials won’t have you know it, but the film is a prequel to Scott’s 1979 film, Alien. The term “prequel” is something of a dirty word in Hollywood these days, and therefore, Scott refers to the film as having “strands of Alien‘s DNA”. Okay, so that clears things up. The notion of the prequel doesn’t just show Hollywood’s dearth of originality – it also illustrates that they have little faith in their audience. We can no longer just imagine that characters had lives before they appeared onscreen – now those pre-lives also have to be shown. It’s the cinematic equivalent of meeting someone for the first time and then telling them your life story up until that moment. The prequel isn’t a new phenomenon, though: Zulu Dawn (1979) predated the timeline of 1964 Michael Caine film Zulu, while Butch and Sundance: The Early Days (also 1979) was set before the events on the blockbuster 1969 western, Butch Cassidy and the Sundance Kid (something of a necessity, considering the titular characters met their demise at the end of George Roy Hill’s film). However, the prequel concept really took off in 1999 when George Lucas launched a prequel trilogy to his hugely successful Star Wars franchise. Of course, this wasn’t the first time that Lucas dabbled with a prequel film: the second Indiana Jones adventure, Temple of Doom (1984), was set – for no obvious reason – chronologically before Raiders of The Lost Ark (1981). Since the Star Wars prequels, no cinematic conclusion has been finite. Filmmakers can simply roll back the clock and begin before the events of the initial film in a franchise. Movies like Hannibal Rising, Exorcist: The Beginning and even The Flintstones in Viva Rock Vegas filled multiplexes in the 2000s, trading on name recognition and audience familiarity. If a star didn’t want to do a film, or was simply too expensive, they could be recast with a younger, cheaper actor (see 2003′s Dumb and Dumberer: When Harry Met Lloyd). Last summer’s X-Men: First Class is another example of a studio’s fiscal decision to “reboot” a franchise. While Hugh Jackman is still willing to play Wolverine in his own spin-off prequels, the original X-Men series became too crowded, with Halle Berry wanting onscreen (and financial) parity with Jackman after her Academy Award win for Monsters Ball in 2001. For Fox, it was simply cheaper to restart the franchise after three films, with Michael Fassbender and James McAvoy taking over the roles made famous by Ian McKellen (Magneto) and Patrick Stewart (Prof. X), while costly headliners like Jackman and Berry were written out of the series. Few of these prequels have met the financial or critical success of the original film, but that hasn’t stopped Hollywood from continuing to churn out more of them. The prequel phenomenon continues unabated with Peter Jackson’s Lord of the Rings precursor, The Hobbit, hitting screens this December; an X-Men: First Class follow-up is on the way, and a continuation of last summer’s Rise of the Planet of the Apes is also in the pipeline. Warner Bros is even developing a prequel to the Will Smith-starring adaptation of Richard Matheson’s I Am Legend – presumably titled Before I Was Legend (kidding?). 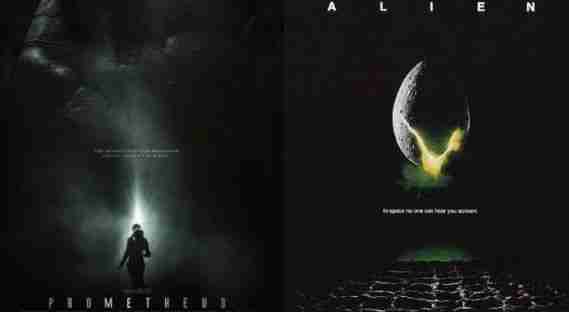 It remains to be seen if Prometheus can recapture the magic of Scott’s original Alien, a film which led to three sequels and two spin-offs in the form of the abhorred Alien Vs Predator films. However, the marketing of the Ridley Scott’s return to sci-fi has been building audience anticipation levels, and if the film is a success at the box office, then it would appear that there was indeed much more “space” left to explore. Prometheus opens in the UK ON June 1st and in the US on June 8, 2012.